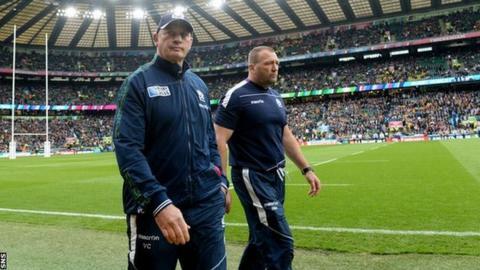 Vern Cotter's first Six Nations as Scotland head coach began in Paris in the first week of February, but given how much rugby has been played in the meantime it almost seems like an eternity ago. In many ways, that game at the Stade de France set the tone for much of what was to follow in the championship - some admirable stuff mixed with some self-defeating errors and all adding up to a defeat, albeit one that contained encouraging nuances. Jonny Gray was a colossus that day. The second-row made 19 tackles and stole two French line-outs to mark himself out as a world class player in the making. Stuart Hogg typified the pockets of elan in Scotland's play, running for 88 metres, the second-highest total of the day. Scotland played with ambition before the French juggernauts trundled in and won the match, 15-8. In what was to become a recurring theme of the season, Cotter's team failed to score in the second half. There was a feel-good about the way that Scotland played, though. So many line-breaks, so much positivity in a backline that was once bereft of ideas. The feeling before round two, at home to Wales, was that a win was possible. They came within three points. Scant consolation. Again, we drew out the upside. Hogg was magnificent once more, the game's most lethal attacker, the full-back adding another 144 metres, and a try. After a poor 2014, Hogg's devil had been restored and he was delightful to watch. The points famine returned, a 25-minute block in the second half where Scotland went pointless. There was controversy, too. Glen Jackson, the referee, dished out penalties and inconsistencies like confetti at a wedding. Cotter felt aggrieved and expressed his disquiet in his own inimitable way. The less the Scotland coach says the more chilling he becomes. Stern Vern has no need for a hair-dryer. Two games, two honourable losses and now Italy to come. This was the day that Cotter's championship would achieve lift-off. That was the plan, but not the reality. It was a cataclysm. Discipline went out the window. Thirteen penalties made it 38 conceded in three games. Too many. In that fateful second half, Scotland spent 62% of the game in Italy's half and scored the sum total of three points. The flair of the opening matches evaporated. 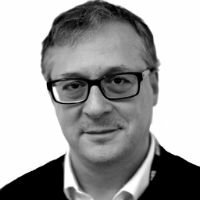 Still, the win looked likely until Peter Horne, playing nicely up to that point, missed a kick to touch and Italy grew as a consequence. The great Sergio Parisse took control. Scotland lacked that kind of leader. The endgame was horrific. Two yellow cards in quick succession for Scotland. Confusion. Panic. Then a late try that gave victory to the visitors. This is the ultimate one-that-got-away. And it was sore. Where there was hope, now there was despair and the dread of a whitewash. Scotland went to Twickenham, got their noses in front at half-time then sank. Another 40 minutes without a score. There were good things in there, some big performances, some suggestion that there can be a brighter tomorrow, but the bottom line - four losses from four - came as a kick in the gut. The Wooden Spoon was served up on a dramatic last day where Scotland's only role in the championship-defining drama was as Ireland's whipping boy. Once more, 40 minutes went by without Cotter's men troubling the scoreboard. As the home team came to terms with their failure, the Irish took over Murrayfield. Champions again. In the midst of this despond, Glasgow emerged. Thank goodness. They were like a beacon in the dark. Their Pro12 semi-final win over Ulster at a heaving Scotstoun and their conquering of Munster in the final in Belfast summed up what Gregor Townsend has created. Both of those wins were seismic, but in different ways. Against Ulster, it was a grind, a test of endurance, will and nerve - and Glasgow passed it right at the death. The final was an exhibition of their ambition and their execution. They were a riot of clever and accurate rugby, a joy to behold. What quickened the pulse wasn't just the fact that Glasgow won the Pro12 for the first time, it was the way they won it. No sense of anxiety in the final, just an embracing of the occasion and a belief that they were good enough to set it alight. Edinburgh had a major journey in the European Challenge Cup. They made a final, too, but didn't have the confidence that Glasgow had and a great chance was lost against Gloucester. Their Pro 12 was poor. If Glasgow's next challenge is proving their worth in the Champions Cup then Edinburgh's is to make the top four of the Pro 12. It's time they delivered. Summer saw the countdown to the World Cup. John Hardie was parachuted in from New Zealand and straight into Cotter's squad. WP Nel and Josh Strauss made it, too, on the residency rule. Every game that Scotland played had a fascination. The eyes of the rugby world were on their opener against Japan, who had just caused international tremors by beating the Springboks. Scotland scored five second half tries to win by 35 points. Hardie scored the game-turning try - and made 21 tackles to boot. The protest against his sudden arrival on the scene quietened somewhat in the wake of a wonderful performance. The USA were seen off with another five-try romp, a further illustration that Scotland now possess an ability to score that hasn't been as strong for 15 years. There was an unbreachable gulf in power against the Springboks in the third game. Even still, Scotland's capacity to conjure a try out of nothing served them well and kept within seven points until the hour-mark. They had no right to be that close. In the end, it was 34-16 to South Africa. That was about right. The must-win game was won, but only just. Scotland weren't so much in a hole against Samoa as a crater. Defensively they were a shambles, conceding three tries and 20 points in the opening 21 minutes. In previous years, Scotland might have folded altogether after that start, but they didn't. They fought against their own deficiencies, stayed calm, drew level with a converted Hardie try and saw it out in the second half. It was heart-stopping, but it was enough. They were in the quarter-finals. And now it got serious. The Wallabies had been supreme in their pool of death with England and Wales. They had a wondrous attack and a defence that the Welsh couldn't score against when the Wallabies had two men in the bin. Scotland scored three tries against Australia. The problem was that Australia scored five. Well, it was one of the problems. The other was a referee who made a bad call under pressure and then ran away. Everybody looked at Craig Joubert, but the bigger truth could be found by looking in the mirror. Scotland played clinically and heroically in attack and had earned their lead going into the closing minutes. They had a line-out and had they secured it they would almost certainly have made the semi-final. The line-out was a mess and the controversy happened as a result. It was a missed opportunity that will live with this team forever. Going into 2016, what do we expect of Scotland? It's impossible to know. The World Cup would indicate that Nel has made a big difference to the scrum and that Hardie has a made a huge impact in the back row. The Gray brothers can be immense in-between. As a pack of forwards, they're very encouraging. There is a menace about the Scottish backline that excites, but also a vulnerability that's worrying. Scotland can score, but can they stop the big guns scoring? They conceded three tries against South Africa, four against Samoa and five against the Wallabies. Three wins from their 10 most important Tests in 2015 is a meagre return, but there are signs of life and hope. Scotland have the talent to turn those numbers around, but they need to get mean in 2016.